Beautifully engraved SCARCE certificate FRAMED from the Hartford and New York Transportation Company issued in 1887. This historic document was printed by the American Banknote Company and has an ornate border around it with a vignette of a river boat. This item is hand signed by the Company’s President ( E. S. Goodrich ) and Treasurer and is over 121 years old. 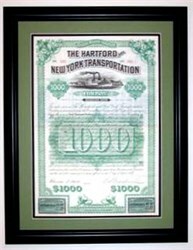 The Hartford and New York Transportation Company Certificate will be double matted as shown in the illustration. This contemporary, black frame is 1" wide with an overall size of 13 3/4" x 17 3/4". Archival mounting, acid free backing, and clear glass are used in preparing your custom framed certificate. The cost of the frame (including labor) for heavy duty packaging, and USPS priority, insured mailing in the continental United States is included in the price. Mailing to Alaska, Hawaii, and international destinations is available at actual cost.